Asheville was the start of our journey up the Blue Ridge Parkway. 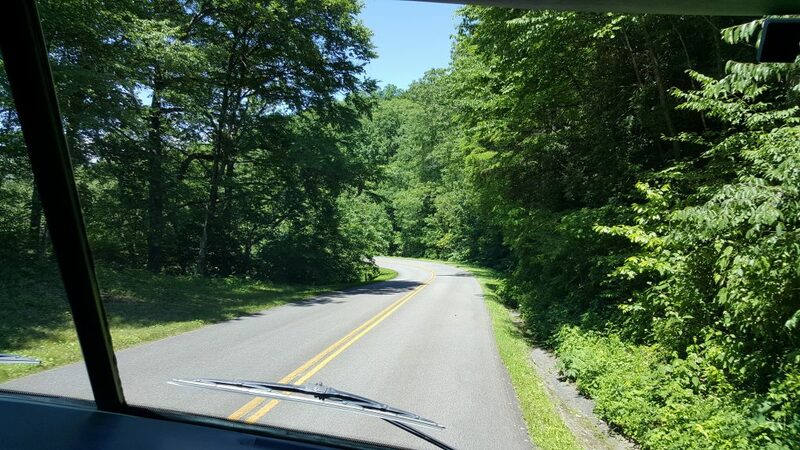 It’s stunningly beautiful with amazing views and is well maintained, but isn’t the easiest driving in a large RV with a “toad” (tow vehicle). Lots of up and down; we even had to stop once because the brakes were overheating. 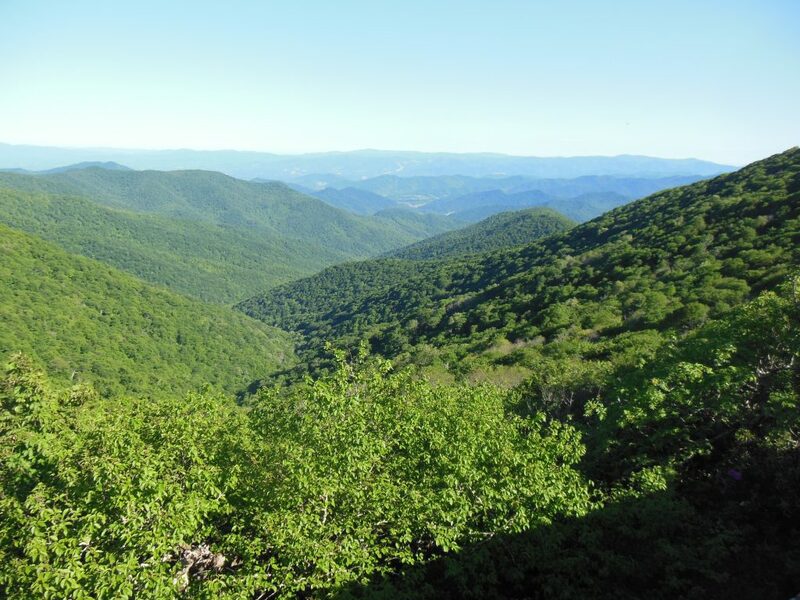 Unlike other National Parks which tend to be left “natural,” the Parkway is “manicured” so the roadways are mowed, trees maintained and it really does look like your’re driving through a garden rather than complete wilderness. Miles of tree-lined, park-like roads winding up and down along the ridge. There are excellent viewpoints all throughout, allowing people to pull over and enjoy the views without causing injury to themselves or others. Since it was a weekday early in the season and we left early in the day, we encountered very little traffic, which was nice. Views that go for miles and miles. 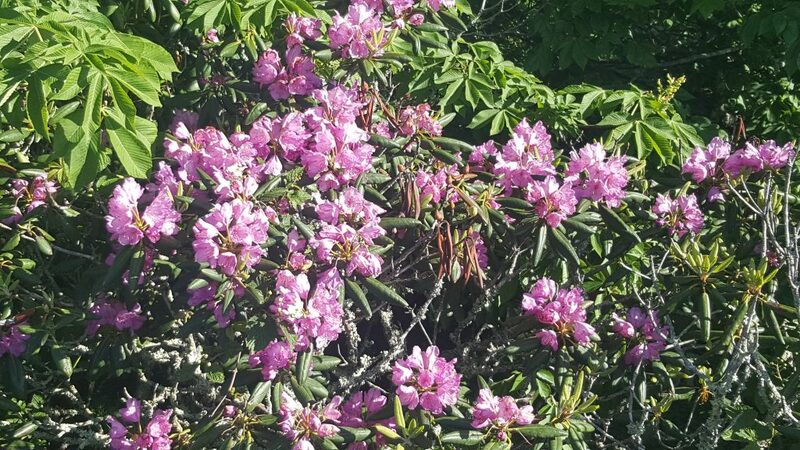 The rhododendrons were in bloom, all over the hillsides. It was beautiful. 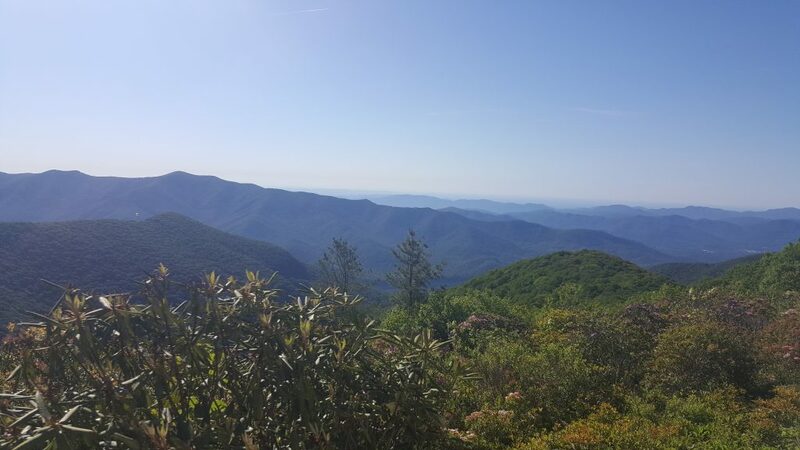 The Parkway really is along the ridge, and at times you can see on both sides for miles and miles. 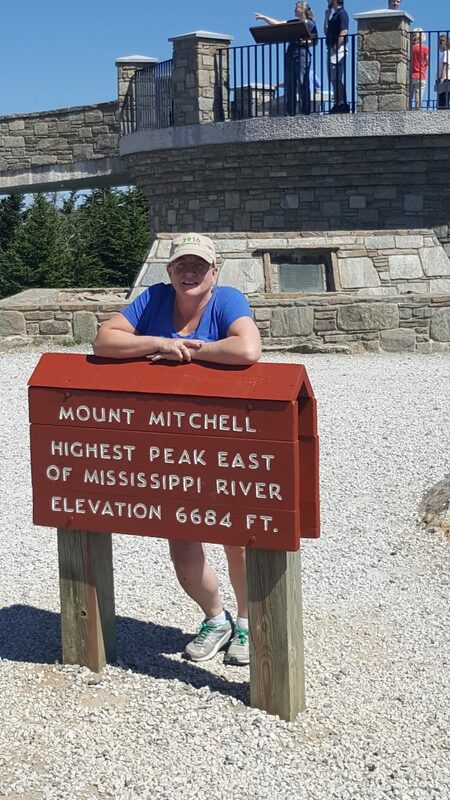 Mount Mitchell is the highest point east of the Mississippi River. I’d thought it was Mount Washington in New Hampshire, but apparently I was wrong about that. There is a 360 degree view from the platform; about 40 – 50 miles in all directions. Quite amazing, actually. And we were told that it is rarely as clear as it was on the day we were there. Actually made it to the top! And we stopped along the way to walk down to the falls … but we took the wrong trail and ended up at the top, not the bottom, of the falls. The hillside path wound down through the woods. 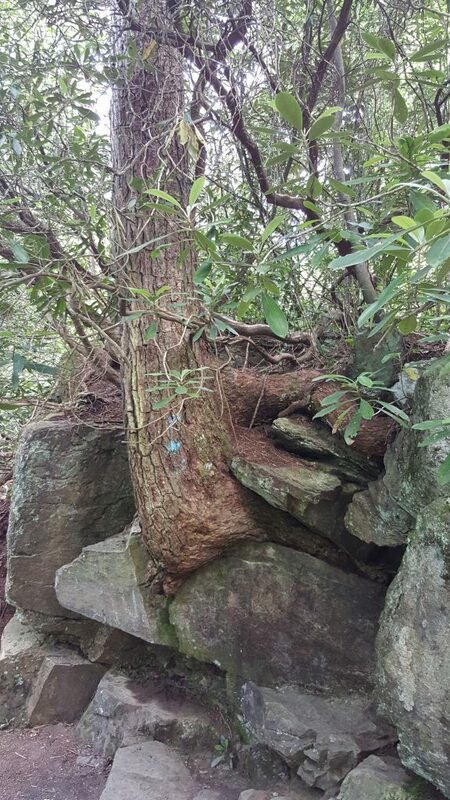 Trees growing on and around the granite (I think) boulders, changing and adpating as the hillside slid and moved around them over the years. Amazing determination to survive, despite the harsh environment. A beautiful pool at the top of the falls. 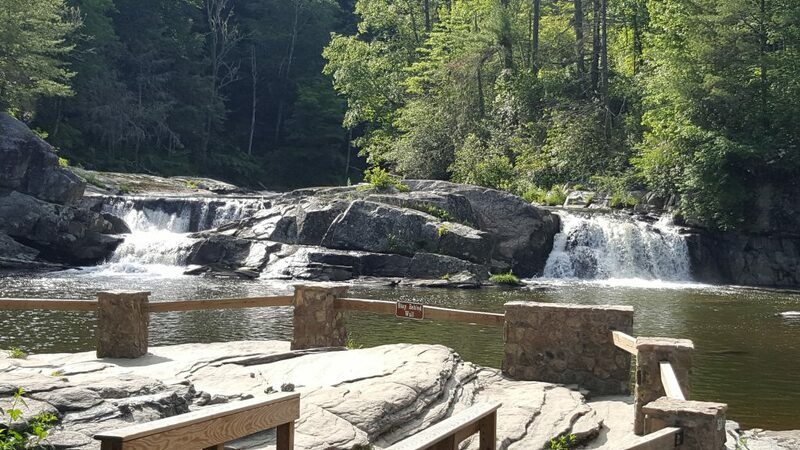 Just below the pool, the start of the falls could be seen, crashing through huge boulders and then out of sight. Despite all the signs warning of the danger, there were still a few fools that wanted to frolic in the water. Pool at the top of the falls. Between the stops and the slow driving (averaging about 30 mph), our 111 miles took nearly 9 hours. We spend the night in one of the last rest areas before the turnoff to Boone, NC. Except for a few people apparently looking for Lover’s Lane, it was quiet and peaceful. In the morning we headed down to Todd, NC, where we spent a nice early afternoon visiting with friends Tina and Richard Roberts at their mountain hideaway. Duke got to make friends and swim in their little pond; and Marie got to see Tina’s impressive workshop (she owns Orianna Naturals). 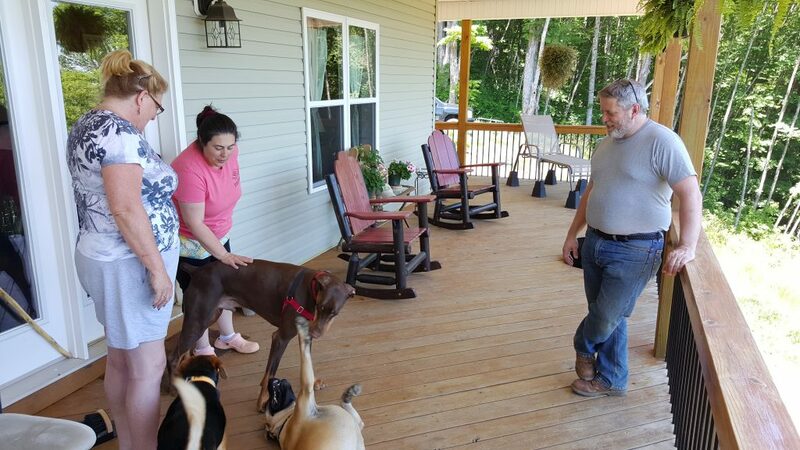 Marie with Tina and Richard; Duke making friends. After we left Tina and Richard, we started our way into Virginia.